TurnsPro is a motorized rotating camera mount for smartphones, GoPro, action cameras, compact cameras and DLSRs (under 1 kg) - the ideal gift for gadget, photography and GoPro enthusiasts. Use TurnsPro to create unique panning time-lapse videos, panoselfies and smooth panoramic photos. Select rotation speed (from 20 seconds to 10 hours), direction (clockwise, anticlockwise or panning back and forward) and angle (from 15 to 360 degrees). 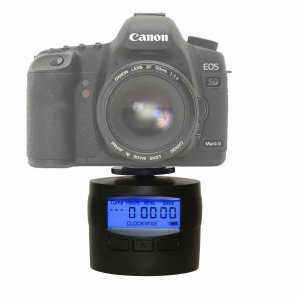 No other panning timelapse mount has all of these features for the price. 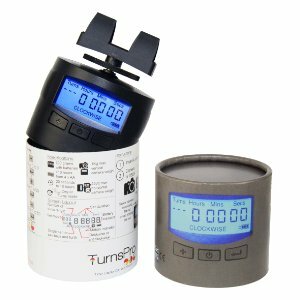 Rotation speed - Specify 360° rotation time from 20 seconds to 10 hours in 1 second increments. Rotation direction - Rotate clockwise or anticlockwise or pan back and forwards over a set angle from 15 to 360 degrees in 15 degree increments. Batteries - 4 x standard AA batteries (not included) easy to replace and carry spares, gives approximately 10 hours operation time. Screen - 50 x 20mm Back-lit LCD display for night use. Tripod & camera attachment - 1/4" - 20 UNC female thread on the base for tripod attachment and 1/4" - 20 UNC male thread on the top for camera attachment. 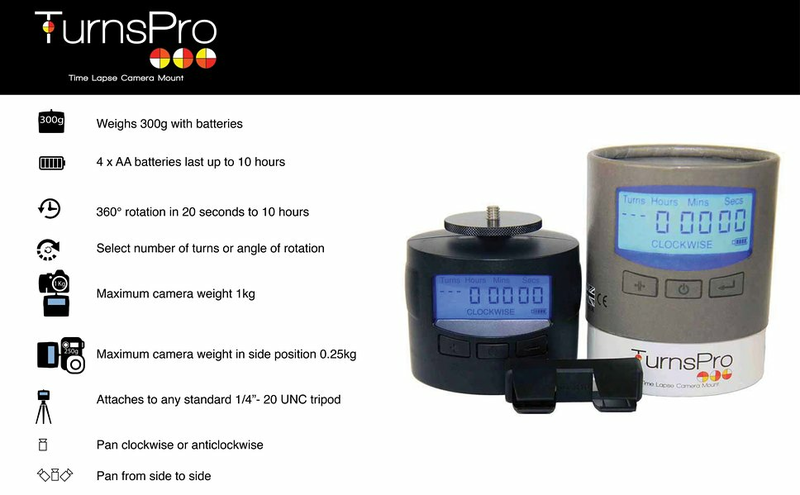 Maximum camera weight - up to 1kg in upright position or 0.25kg with the TurnsPro on its side. Weight - 241g excluding batteries. Light and easy to carry, easily fits in a coat pocket or camera bag. Manufacturer - Designed and made in Devon in the UK by TurnsPro. Package contents - 1 x TurnsPro Time Lapse Camera Mount, 1 x TurnsPro Smartphone Clip and 1 x Instructions Box. 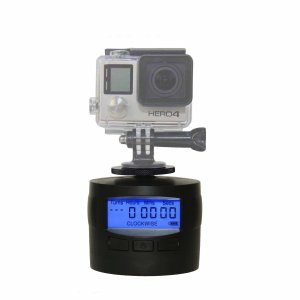 Extras not included in this listing - 4 x AA batteries, Ball Head Mount and GoPro Tripod Adapter Mount. Compatible cameras - Use with a GoPro (GoPro Tripod Adapter Mount required), Action Cameras, small DSLRs (under 1kg), compact cameras and smartphones. Create panning time-lapse videos using video or photos. Take panoselfies - panoramic photos with you in them as well as the landscape. Share your videos online with the tags #turnspro #timelapse360. 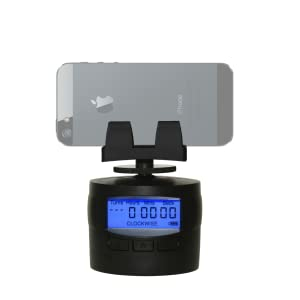 Many people start out creating panning timelapse videos using a standard egg timer. This is a great start, but you are limited to one direction and one speed. Typically it is clockwise and 360 degrees in an hour. TurnsPro allows you to have much greater customisation to these shots, allowing you to find the optimum speed, direction and angle for the shot you need. Create unique panoramic shots using TurnsPro and panoramic mode on your camera. The world has gone selfie mad, people are taking selfie poles everywhere and snapping constantly. But selfies only get you in the photo, not your surroundings. 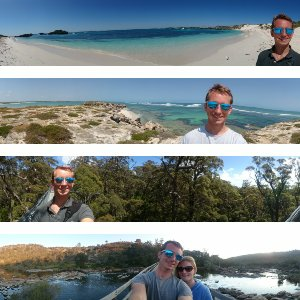 TurnsPro can be used to create unique 'panoselfies', taking a panoramic photo that includes you, your friends, family and the scenery. Simply set TurnsPro to complete one rotation in 20 seconds (the maximum rotation speed) and set your phone or camera to panoramic mode. Start the TurnsPro rotating and start the panoramic capture on your camera equipment to take a smooth panoramic selfie. TurnsPro comes with a smartphone clip to mount your smartphone. Compatible with most smartphones. Use a timelapse app or the timelapse function on an iphone to create panning timelapse videos with TurnsPro. Use panoramic mode with TurnsPro on a 20 second rotation to take a #Panoselfie with you included in the panoramic shot. TurnsPro is perfect for adding a new dynamic to your GoPro videos and timelapses. Mount your GoPro to the TurnsPro using a standard GoPro Tripod Adapter. Create amazing night panning timelapse videos and high quality panning videos using your DSLR or compact camera with TurnsPro. TurnsPro has a maximum weight capacity of 1kg, suitable for most small DSLR cameras with a small lens.